They should be in your fly box? Dragonflies, si; mosquitoes, no. Why, you ask? Because I have never been biten by a single one. How about you? When you are in a situation where the water is covered, overgrown and green, you'll find that using dragon larvae (or its imitation fly) is exactly how you want to bait your hook. Lots of people have great luck with this bug. People have been using dragons for fly fishing for ages and after you try it, you'll know why this tradition has lasted as long as it has. When choosing a fly pattern to fish with, consider the dragonflies' life cycle. You'll find that it starts when females lay their eggs near the water. They will deposit the eggs on floating plants. When the larvae hatch out of the eggs, they will live under the water, using internal gills. At this point, while remaining under the water, they will catch water insects and may even devour tadpoles or tiny fish. You'll find that this amazing insect can stay in its larval stage for five years, depending on the species. When their larval phase comes to a close, a dragon will climb up on a plant at night and begin to breathe. Their skin will split, much the way a butterfly's cocoon will, and the dragon will crawl out. When the sun rises, it will dry its wings and fly off, knowing to seek out midges and flies to devour. This stage of life can last for upwards of four months. It is worth noting that no matter which stage of life it is in, it's always appropriate for use as bait. These insects are carnivorous, and if you find that you are in a situation where you need bait and need it fast, you can try a trap that Japanese children use to catch them. Just put a very small weight on the end of a string and swing it through the air. The fly, seeing food, will go after the weight and get tangled up in the string. There's definitely a trick to this, but if you have small children who want to “help” you fish, this can be a great way for them to get in on the action. They come in hundreds of different varieties, and you'll find that with just a little bit of work that you'll be able to figure out which ones are perfect for the place that you are fishing. 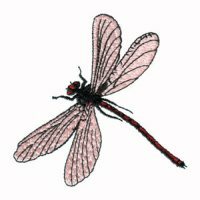 Take some time to learn about dragonflies. You'll be glad you did! !